When you think about mobile advertising, you might think the iPhone or Android are the hot platforms (thanks to ads like this). But you’d be wrong. Some new December data from the mobile advertising company Smaato suggests that it’s actually Symbian that kills both the iPhone and Android. Now, I know what you’re thinking: that’s because Nokia, despite the buzz surrounding the sexier smartphone devices, remains the biggest mobile player in the world. But actually, the numbers are for the all-important click-through rates on the various platforms. As you can see in the chart below, with the average CTR on ads for all mobile platforms set to 100, Symbian led the way by far with a 161 score. 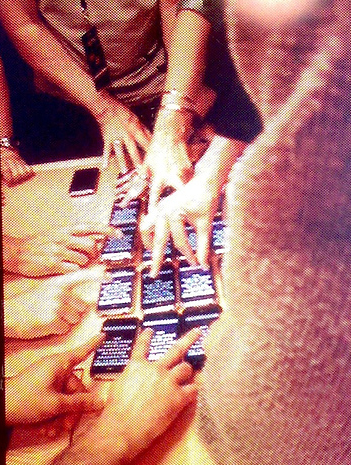 This was followed by the iPhone (and iPod touch) with 119. Android? They’re way down the list with a 65. Only Palm and BlackBerry fared worse. So why is Symbian doing so well with click-through rates? 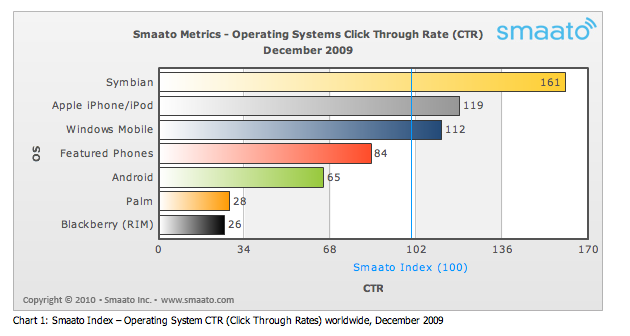 Smaato suspects is may have to do with the high saturation of Nokia devices in emerging markets. But they also note that the CTR in the U.S. are higher for Symbian, though on a much smaller scale since Nokia isn’t nearly as popular here. 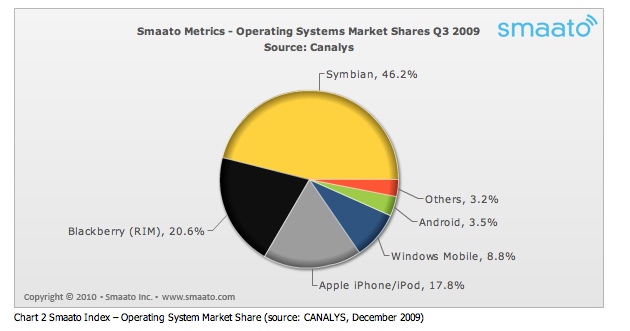 In terms of overall usage, Symbian makes of some 46.2% of the phones that Smaato tracks. RIM (BlackBerry) is in second place with 20.6%, but the iPhone is quickly catching up, with 17.8% after experiencing huge growth this year. But Smaato expects Android to the the big mover in 2010, likely going from just 3.5% now to over 10% by the end of the year. Something else interesting from the report: Quattro Wireless tied Millennial Media as the top-performing mobile ad network in the U.S. That’s significant since Apple just acquired Quattro after Google stole AdMob away from them. Smaato didn’t specify AdMob data in its report.